The gentleman on the right is our dad, William “Bill” Brown. Dad was the manager there when it opened until he moved to manage the “A-Mart” at the old fair grounds location on Fairfield Drive next to “Woolco”. The gentleman on the right was my dad, William “Bill” Brown. He was the manager when the store opened until he moved to manage the new “A-Mart” that opened at the old fair grounds on Fairfield Drive. The car was a promotion for a car race (Daytona?). LOVED going in there! The fresh ground coffee smelled soooo good! Definitely was not within walking distance, like Kwik Chek/Winn Dixie and Friendly Service! I’m curious, Frank: Where were the Winn-Dixie and Friendly Service on 12th? I so wish that A&P was still there. That would be my neIghborhood grocery…instead of Barnes! Anyway, remember the fresh ground “8 O’Clock” coffee smell when you went in there? I’ll never forget that! Thanks for putting on the photos, really enjoy seeing them! The Torino is a ’68 GT. Ford made them to qualify their NASCAR efforts (had to make and sell a certain number of production cars of the same model). The fastbacks are more aerodynamically slippery. I seem to recall the A & P was still operating in the 90’s. Today the building has been remodeled and is now the Gulf Coast Kids House. That’sa a 1968 Torino GT (note the wheels). 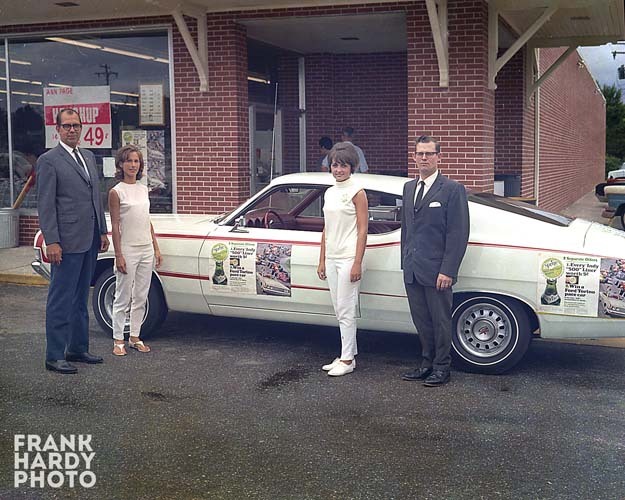 The fastback model was developed for Ford’s NASCAR program, and was more aerodynamic than a coupe. Great pictures!